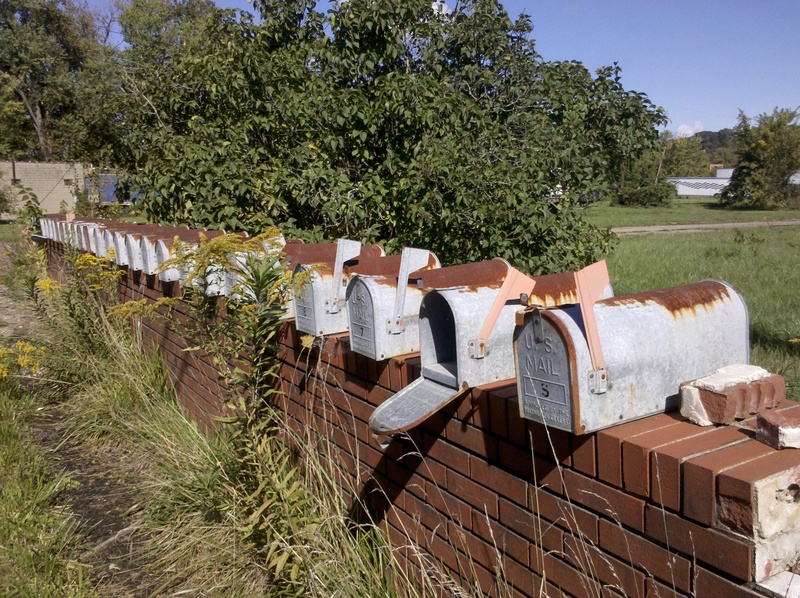 A vacant row of mailboxes distracted me for nearly thirty minutes from my hike. 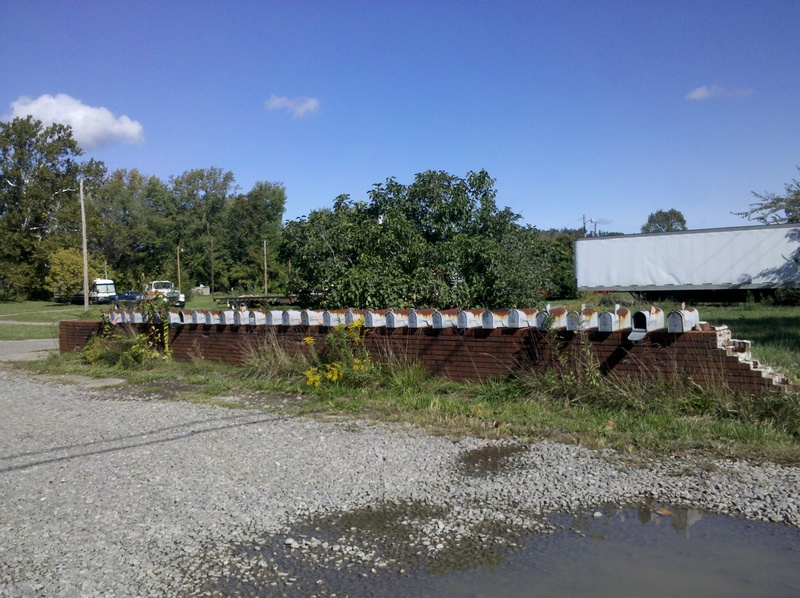 Imagine how strange it must have been for passersby on the busy road to see me in partial squat, writing in my journal, in an empty and overgrown lot in front of these boxes. After moving to our latest assignment in Coshocton, Ohio, I announced my new mailing address and received one postcard. And for my birthday, I received 3 cards (the lowest yet) and hundreds of Facebook wishes. Don’t get me wrong. I LOVE my Facebook “Happy Birthdays,” especially since this birthday was spent entirely alone. It gave me connection. But in this era, post–cards, that postcard I received recently came on a day I was pondering my own disconnect from “tangible” communication and my addiction to filling the loneliness through Facebook, as I wandered around this empty row of mailboxes. That postcard hit happiness nerves I didn’t realize were dormant until the moment I pulled it from the mailbox. Challenge to my readers: Surprise someone with a real postcard or card. Send it to someone you love. Send it to a stranger, or send it to me. See how it makes you feel knowing you’re going to connect in a much more personal way than we have in maybe a decade. Please feel free to comment below on how it made you feel to send it, or come back and tell me the reaction you had when the person received it. Hi Marla….Don’t know if you have ever seen Sendout cards, but they are totally awesome. You can customize them with pictures right off of friend’s facebook accounts. Hi Amy, thanks for reading and commenting! 🙂 I have heard of them. I think it’s a good way for people to make sure they never miss an important event or birthday, and brilliant for businesses. I’m one of those who gets geeked out over picking out specific stamps and stationery and love the connection of writing it out. I’m a rare breed, but I sure wish many of my friends and family used Sendout cards (especially the ones who all just missed my birthday, hahaha). We have an 80+ yr old friend who sends postcards regularly, just to check in We send postcards when traveling, especially to “the grands”. I love sending postcards. My favorite ones are when I can find a postcard that’s of one of my regular writing spots. I just feel like I’m sending something much more special then. I love sending postcards, whenever I travel I buy a bunch of them and write something really inappropriate so the gossipy neighbors or mailman can read have a little fun reading. I loved your idea. Shhhhh I got you a postcard yesterday and posted this morning before you commented…. Shut the front door!! Really!? <3 That's so great! I can't wait to get it and read what you sent!